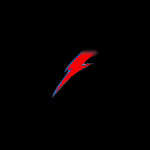 Here is a load of David Bowie icons, you can use them as your avatar if you wish. Wow, these are really cool, thanks a lot! No, I got them from many internet sites. However, I can make one, if you want a certain picture. ^^^ I DID NOT MAKE THIS ONE. I just resized it. I don't remember who made it, but when I do find out, I will give them credit. I made the rest. Feel free to use these. I might post more someday. YAY! You have the rank little wonder!! Subject: Re: David Bowie icons.